On 5th February 2018 the Westerham Society launched of our Heritage website with historical records about the town of Westerham. 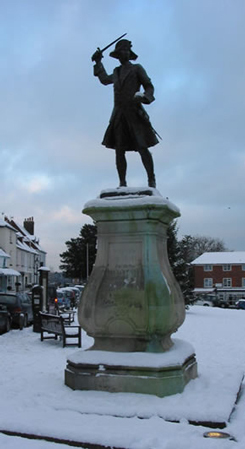 The Heritage project was four years in the making, seeking expertise, gaining Lottery funding, collecting and organising data and providing a wonderful product for current and future generations of Westerham. Congratulations to Bill Curtis and his front line team of Jacs Taylor-Smith, Louise Wood, Jenny Smith and Stuart Merrylees. Bill has chiefly been responsible for collection of historic material from Westerham families and other varied sources even from the days prior to this project. New stories and images about local people and events will continue to be added to the Heritage Collection. The Society’s AGM was held on 22nd March 2019. The existing Officers and Committee Members were re-elected for another year. The Chairman’s report highlighted the positive achievements over the last year in terms of enhancing the social interaction within the Society, increasing the membership numbers and the continued community support activities. The plans for 2019 will maintain the same focus and continue with a similar range of social events. 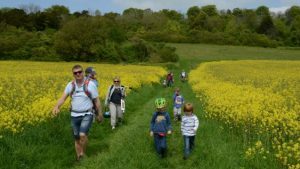 The traditional Beating the Bounds family walk around the sign-posted route of the Westerham Parish boundaries starting from 8.00 am. The event is free and walkers can undertake all or part of the route. Walkers can finish at The Green where they will be able to enjoy food, refreshments, stalls and entertainment. This year the Fair on The Green will be a joint event between The Westerham Society, Westerham Town Partnership and the Edenbridge & Westerham Rotary and will run from 11.00 am until 4.30 pm. Come and enjoy the day. Please see our Upcoming Events for more. You can also see a list of our Recent Events.